June 13, 2018 - by Ilda - 22 Comments. At a time when the journalism profession is suffering from a bad reputation due to the proliferation of fake news, along comes Stephen Sackur to save the day. Sackur is from the BBC talk show production HARDTalk and is known for asking his guests from around the globe hard-hitting questions. His earlier interview with Philippine Senator Antonio Trillanes in 2017 made the Senator a laughingstock among Netizens after he was exposed by the journalist as a fake democracy advocate. A lot of Filipinos consider Sackur a hero and someone Philippine journalists should emulate. Sackur’s excellent research skills about his subjects was on display once again during his recent interview with ousted Chief Justice Lourdes Sereno. In his interview with Sereno, Sackur asked Sereno why, after saying initially that she didn’t want to get involved in politics, did she openly criticise Duterte’s policies. Sackur even mentioned that Chief Justices in other countries like the United States and in Western Europe don’t normally meddle in political affairs. As a judge, her move was quite irregular, indeed. She was showing partisan politics when, as a judge, she should have remained neutral. Sereno’s response was a direct attack on Duterte by saying the President was leading the country to a system where “he thought he could disregard the constitutional guarantees” of individuals. Sereno added that she was forced to remind everyone of the constitution. She justified her criticism of Duterte by saying she is continuing the “fight” for democracy. Sackur then reminded her that proof of the country’s democracy is Duterte winning the election and at the same time telling her that she is only an appointed judge, meaning her mandate did not come from the people unlike Duterte’s. Sackur also reminded Sereno that the minute Sereno decided to criticise Duterte’s policies, she called attention to herself and, in doing so, risked scrutiny. Unfortunately for her, her personal affairs “couldn’t stand up to the scrutiny and real problems were exposed”. Indeed, if there is a lesson to be learned from Sereno’s ouster it is this: if you are going to criticise someone like Duterte and accuse his moves as unconstitutional, you better make sure you haven’t broken the law yourself. Sereno seems too arrogant to admit she did though. She still insisted that she filed her Statement of Assets Liabilities and Net Worth religiously even when there was no proof she did. She insisted that missing SALNs does not necessarily mean she didn’t file them. Sereno’s statements against Duterte during the interview justifies why the President considers her an enemy. It was one thing for her to criticise Duterte before the Filipino public, but it was quite another to badmouth him during the HARDtalk interview when he could not defend himself. She made Duterte look bad to the international community by saying he was attacking the judiciary and weakening the country’s democratic institutions. Sereno was equating her removal to an “attack” on the judiciary. That is false. She had to be removed because her appointment was illegitimate. She wasn’t qualified to hold the job. A month after being removed, the judiciary is functioning as normal. It was a good thing Sackur read up on Quo Warranto because Sereno’s usual arguments like “impeachment is the only way to remove an impeachable official” did not pass. He emphasised that Sereno’s own colleagues lost confidence in her. But of course Sereno tried another lame argument by subtracting the six justices she accused of being “biased” against her. She said that five judges testified against her during the Congressional hearing and the other judge was against her religion. She proudly concluded that in effect, there were only two judges who voted to oust. That is proof she is delusional. Good thing her arguments were dismissed by the presenter. What is astounding was how Sereno was still insisting that the missing SALNs were not grounds for impeachment. It was a shame that the Sackur was not able to mention Sereno’s predecessor – the late former Chief Justice Renato Corona – who was removed from office for not declaring some of his assets in his SALN. Sereno’s non-filing of SALN is definitely a worse offense than Corona’s. I suppose this detail was unfortunately something that Sackur could not cover due to time constraint in his program. It would have been great if there was another guest from the other side who could rebut Sereno. While Sereno sounded confident, her responses were weak. She simply kept denying she broke the SALN law and slammed those who were against her by labelling them biased and attacking her. Towards the end of the interview, Sackur was already hitting Sereno hard probably because he could sense her arrogance. He exposed the fact that Sereno was contradicting herself and was being a hypocrite in her supposed advocating for the integrity and independence of the justices of the Supreme Court while, at the same time, not respecting the decision of the majority to oust her. Sackur wanted her to know that her problem was simple – that she could not accept that her colleagues lost confidence in her integrity. A very painful thing to hear but that is the truth. Her colleagues in the Supreme Court were most likely taking note of her responses during the interview and could very well use it when deciding on her Motion for Reconsideration. Sadly, Sereno also insinuated that she will not give up her “struggle” even if the Supreme Court upholds their decision to oust her through Quo Warranto. She said a lot of people are now counting on her to continue to uphold democratic institutions and are encouraging her to speak up. That only means she will continue playing the Victim Card and badmouth Duterte and the justices who voted to oust her. She’s not fighting for the people; she’s fighting for her bruised ego. She is simply Noynoy in lawyer form. Entitled, never wrong , nil achiever and a victim. Ateneo really must have something in the water. Hope they get Ressa or Robredo in there next time. Ressa specially, since she likes to have the focus on her and Rappler most of the time, anyway. Might as well be in that stage. I love Mr sackur, he is relentless. People from your countries should avoid these shows totally as they typically get crushed or shown up. Cayetano on RTs worlds apart was not much better. It was 30 mins of kissing up to Russia and fence sitting. I love it. These Pinoy Pride people in government with their nose in their air go to an international audience for all foreigners to see just how bad they are. They can fool the Filipinos, but not the foreigners… and thus, government hates foreigners in the country being involved in any form of government. Pilipinos want to see pnoy next at hardtalk. And don’t forget his sister kris aquino as well. ???? ” You have the right to remain silent. Anything you say, will be used against you in the Court of Law. You have the right to have an Attorney, if you cannot afford one, one will be appointed to you by the Court. With these rights in mind, are you still willing to talk with me about the charges against you ?”. Unfortunately, with cases still pending for the ousted Supreme Court CJ Sereno; she still opened her mouth in arrogance; branding her fight, as the fight for “democracy”. It is pathetic to see her defend herself, with international audience viewing her interview. 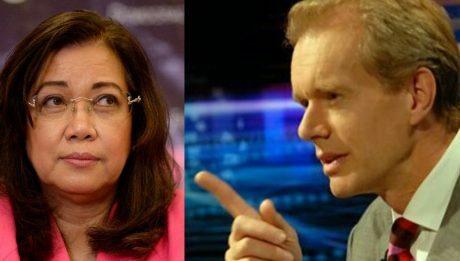 Maybe, the foreign audience of Mr. Stephen Sackur, are wondering: ” How in the hell, these people appointed such ignorant Supreme Court Chief Justice ?” It is really a shame for us, we have first the “ignorant “Trililing” Trillanes, who have no clue of the word: “democrat”. Now, we have an arrogant Sereno, who don’t know how the Judiciary Branch, in a democratic country works. She politicized the Supreme Court, which must have been, beyond politics. She cannot even file her right SALN, and pay her right amount of taxes. If this guy Shakur interviews Duterte, Duterte would call him a gay son of a b_*çh. I guess you’re referring to Tupac. Too bad he’s dead. Lols. If Tupac Shakur interviewing Du30 would be awesome though, haha. The president should exercise the power vested upon him by the people in a authoritarian revolution cuz democracy is being used to steal the republic thus killing civilization. That was a cringeworthy interview. Sereno gave sensible answers to Sackur’s questions – for example by pointing out that she was defending the purpose of the judiciary with her criticisms of Duterte – and she did it with an impressive show of restraint considering how stupid some his questions were. Sackur appears to know less than nothing about The Philippines and presents an utterly naive view of its problems. He fails to properly explore the central conundrum here: that while the Philippines technically HAS a judiciary, it is a non-functional one, ruined by typical Filipino traits such as feathering their own nests, lying and conniving, and failing to even understand concepts like fairness and justice (or the nuances that lurk therein). Thus it might be theoretically reasonable for a President to subvert an institution that’s failing to fulfil its purpose, but probably not reasonable for him to do so by deploying the exact same methods that make it a failure in the first place. Having said that, her bumbling answers about her SALNs were hiliarious. Did she file them or didn’t she? A judge – especially a Supreme Court judge – should remain non-partisan. The minute Sereno, who was the Chief Justice then, made statements against Duterte’s policies, she made her bias known. That means her judgement on cases filed against Duterte with the Supreme Court would be tainted. As she explained in the interview, her criticisms of Duterte’s policy had a valid legal basis. In other words, she was doing her job. The central problem here is that doing your job in a failed state inevitably has “political” overtones. I’m not defending her as such. I doubt she’s as pure as the driven snow. However her answer to Sackur was reasonable, and he had no comeback except a rather weak one, ie., Duterte said her actions were motivated by partisan bias, so therefore she was. She’s not a politician. She was a Supreme Court judge. Judges shouldn’t comment on issues that could potentially land as a case she has to rule on. If it had come up as requiring a judgement, I assume she could have refused to sit, or even resigned. Sackur is completely wrong about there being no precedent for this sort of thing: senior judges comment on political issues all the time in the West. While it might be ethically wrong for judges to comment on (say) a political issue that might affect an election, you seem to be arguing that a politician can break the law or flout the Constitution and expect no censure from the judiciary: the issue here is only whether Duterte actually had done that, or whether Sereno had reasonable grounds for stating that he had. Her political beliefs, and even her personal affairs, have no bearing upon it. The Civil Code and the Constitution in this country are both poorly-written documents, but they are nevertheless the Law and it’s the job of the judiciary to defend them. Her criticisms of Duterte and no one else betray partisan leanings. That still makes her fail her job as a justice. Her partisan leanings make her go for injustice instead of justice. Oh yeah? So the other justices can accuse, testify, and volunteer information against another justice on issues they may have to decide on later, which they actually did, and Sereno can’t? Girl, are you confused big time. sereno is one unimpeachable liar de facto cj. how can she be impeach? we are not dumb here not to understand the laws of the constitution. Do not call Sereno Ex-CJ or Former CJ as she was not qualified from the very start. She just have the leisure of sticking the word CJ to her name because of one STUPID of a President. The only people who hate truth are those who are living lies. There is a difference between being straight up rude and being real and polite. If you are offended by someone being real, authentic and honest. Than you have an ego problem.